Are you looking for Very Fast Loading Blogger template or mobile friendly or even SEO friendly template then let me tell you dear this article is for you, yes if you want to get rid of this template issue, I mean may be you have come to know from others that your template is not mobile friendly or fast loading even these that, even sometimes we come to know about such things from tools. So, lets learn more about it $ implement it on your blog template, actually if you have right template then it will be easier for you to grab attention of readers which means there would be more engagement, so I was thinking and discussing this issue with my friends and come to know that there is not you are alone there are more than half million facing such problem, basically they unable to get rid of it because they don't have knowledge about it so stay tuned and keep reading this article even I am going to insert videos in this article because it will be much better for you to understand what I am trying to say? Don't have knowledge about blogger template and requirements to take your blog to the next level. So, what you will get from this article, lot of things actually I am going to invest at least six hours in this article only that's why it will much more beneficial for you, of course it takes time to read but later you will get benefits of it. Why You Need Fast Loading Blogger Template? So, are you ready to learn about all these topics in step by step, I am sure you are ready. See, I don't know how you have landed on this page, but yes there is one big reason to read this article till now, either you are new to blogging or you are struggle to attract traffic to blog and may be someone told you to use fast loading template and that's why you are reading this article. There are many reasons to have responsive template but let me share with you story of a blogger, actually one of my friend, of course internet friend was getting problem to generate revenue after even having good number of traffic. So, he told me how he had been able to solve such problem, basically he did a research and found that his blog visitors are mostly browse his blog from mobile so in his mobile he used different template, because in blogger platform we have two templates by default one for desktop and another one is for mobile device and I am sure 90% of bloggers don't monetise their mobile traffic. The same thing happened with my friend that's why he face such problem and even I have learnt a big lesson from his story, so the problem can be solve by using responsive template and of course after using responsive template you have to disable mobile friendly by default template on blogger. Okay, I was talking about responsive template basically responsive templates means the template will be set according to device and of course this concept is very famous among web master because now a days people have different sizes devices so responsive template is really matters. Another thing is really important you need to understand about it, basically what is happening search engine Google started giving preference in search results for mobile friendly templates, so basically if you will search anything on Google you will see there is written mobile friendly, so responsive template is the key to get rid of it. Monetization of your blog will be easier. This is one of the biggest problem of newbies what they thought everything they are going to get for free but in actually free templates having lot of disadvantages like error in templates, not responsive, missing schema even credit on the footer. So, I don't like free template, this is the big reason I have invested money on designers to get designed a dashing template that's why it will have all features and of course all barriers having in free template will not have such barriers. 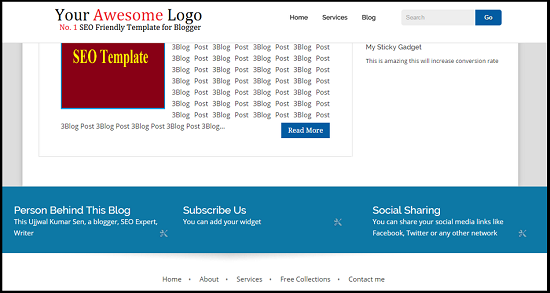 Dear, I am introducing a template which come to the final phase of its launching and of course its not free because it is not having all those problems and once you will buy the template you can use it with any number of blogs. Of course here are few advantages of this template, actually I wanted to share with you all those advantages in a glance one by one that's why it will be easier for you to understand what included in this template, may be you are looking for demo right, so here I am sharing with demo link too. Sticky widget: This is awesome I mean it will definitely going to increase your blog revenue, if you will utilise this feature right way. and of course lets talk about its pricing this is important, if you are thinking about pricing then let me tell you dear, actually I have spent more than 2 months to find out right designer to get designed this template. So, what I did, I have invested lot of money to develop such unique templates and of course the features which is sticky widget is just amazing for getting more conversion rate of your campaign. Because, the ads or things you wanted to promote will be there for all the time while people being on your blog while reading articles, so what happen they will see the banner or text ad, which will increase viewing time of the ad and tough you will get more clicks of that ad, which means more conversion rate. And more conversion rate means you will have opportunity to earn more money, yeah of course this is all about getting quality traffic but for getting quality traffic you need to provide quality things like template, content and of course better engagement among readers. Lets move to the next section in that section I will talk about price of the pro seo friendly template and of course I will give you some special discount for first five customers only. I know this is important even people think to get free template because they unable to find out reasonable affordable price template, see I have spent lot of money and time to research and get designed this template. So, I have set price of this template is only 499 RS and of course if you are think, the amount you can not pay but still you love the template and you are serious about blogging then just contact me on FB (Click Here) and then I will give you some special discount. Now, the next question is that how you can buy this template and of course the way to do payment, because one of the biggest barrier of India blogger is Credit Card payment option, because I can remember I face lot of problem because of this, okay that is reason I have choose Instamojo Payment Gateway and its just superb payment gateway in India. Okay, so here is the link I am going to share with you, to buy this template, I am sure this template can change the way you blog about, wait, I am going to give you another gift for first five customer of this template, what is that wanted to know? Alright that is my e-book which will help you to monetize your blog smart way, that cost about $7 (399 Rs), but it will be absolutely free of cost amazing deal is not it. But, remember my dear its only for First Five Customers of this product, I am sure you wanted to grab the product, so lets go for it. Okay, I hope till now you have lot of time so, let me tell you dear after buying the template you need to installed to your blog, see its really simple to install just you need to follow my instruction and then there you go. In the below video you will understand about it and how you can installed template to your blog, well if you have slow internet connection then you can read my tutorial to installed blogger template step by step guide. I hope you like the tutorial right, actually video tutorials always helps to understand things better way, don't you think so? Template is the key to get success in blogging, because it is the first impression on readers, which shows how you are dedicated to your content, most of the blogger thought to blog for free and earn lot of money but that's not possible if you want to get good output you need to invest money to get better things which helps a lot, at least I have learnt this in my five years of blogging. What do you think about this fast loading template? Yes, this is required for many bloggers. Let me know if you need coupon code for getting discount for getting fast loading template for blogger.